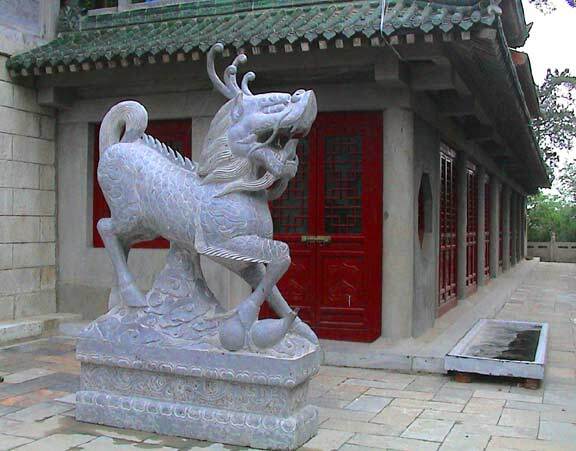 Ornate statues of mythical creatures guard the entrance to Jade Spring Temple. Chen Yu Ming, Abbott of Jade Spring Temple, with Rebecca Kali and Solala Towler. Rebecca Kali, our trip leader and woman Daoist in the inner court yard of Jade Spring Temple. Ancient pavillion in the inner court yard of Jade Spring Monastery. Memorial at Jade Spring Monastery. Chen Yu-Ming and statue, part of the new renovation at Jade Spring Monastery. Ancient stone image of Master Chen Tuan. Jade Spring Temple, covered walkway.